Geothermal power plants use the natural heat of the earth to generate electricity for homes and businesses. Geothermal power is a renewable source of energy and does not rely on coal or other fossil fuels to create electricity. 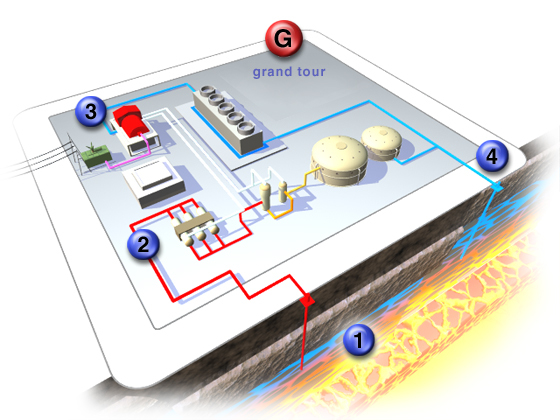 Select a numbered icon to take a tour of each phase of the geothermal power plant operation. The tour begins with a look at the geothermal resources far below the surface of the earth. Next, the tour shows how these resources are brought to the earth's surface and converted into steam, how the steam is used to spin turbines and generate electricity and how the unused fluid is returned to the earth to sustain the geothermal resource so it can be used again. To see all phases from start to finish, select Grand Tour.